The replica of the original Lady Nelson was launched from Ray Kemp's ramp at Margate Tasmania in 1988. She began her voyages soon afterwards, first as a sail training ship in the Derwent, and soon afterwards sailing her first long voyage to Westernport in Victoria. During the next five years the Lady Nelson sailed the eastern ports of Australia before returning to her home port of Hobart . From 1996 until the present time many voyages have been undertaken. From Hobart to Stanley in 1996, Hobart to Strahan in 1997, Hobart to Sydney in 1998, followed by her first circumnavation around Tasmania later that year. Over the next few years the little brig continued to bring many happy hours to passengers, school children and crew alike as she sailed the waters of the River Derwent. Historical tours were conducted to many parts up and down the river. 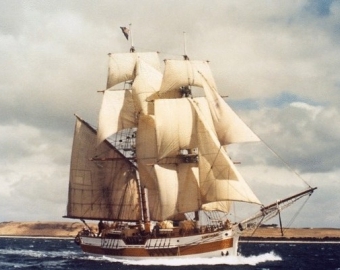 In 2000 she sailed to Portland in Victoria to celebrate the arrival of the original Lady Nelson in 1800 in Bass Strait . This voyage took over four weeks with changes of crew and passengers along the way. During March 2001 the Lady Nelson again cross Bass Strait to re-enact the discovery of Western Port and on 14th February 2002 entered Port Philip Bay 200 years to the day that the original ship passed safely through the Rip. Derwent in September 2003, 200 years after her first visit and this was followed by more bicentenary activities when Hobart celebrated its european settlement on February 2004. With the clearing of the debt in 2001 the Lady Nelson passed into a new era. Now she could take on many tasks that had not been fully addressed since she was built, new fuel tanks, remodeling the gallery, new sails, to mention only a few. The ship is considered to be in excellent condition. The future looks very bright for the Lady Nelson under the guidance of a conscientious board of directors and a long list of volunteers to see that she will be Tasmanian's own tall ship for many years to come. The Lady Nelson under full sail.